After creating a release plan, work with your team's items. Do this from the Team Backlog module or the Backlog module. 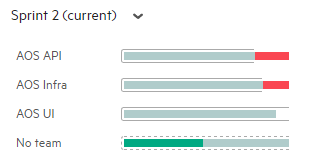 If your team has variable work rates, edit the expected capacity for these periods instead of using the default velocity capacity. For details, see Set sprint velocities. After setting up your release plan, assign each user story to a team member. Do this on a team-by-team and sprint-by-sprint basis. In the Details tab of the item, set the item Owner. From the Backlog Items tab, drag the item to a team member bucket in the Teams tab. For details on what the team member buckets display, see Team planning buckets. Caution: Assigning stories to a team member does not assign its tasks. As a sprint progresses, track the team and individual progress. For details on the release planning buckets, see Use the backlog planning buckets. You measure the progress by story points assigned to all members of the team in the current sprint cycle. Hover over the widget title for a reminder of the commit message format used to associate commits with each type of story. See more information about changes committed by your team in the Commits column. For details, see Use the Commits tab to track committed changes.